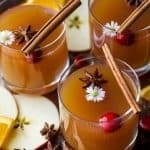 Easy Hot Spiked Mulled Apple Cider a fun cocktail for the holiday season! This Mulled Cider is filled with cinnamon sticks, star anise, clove, all spice, fresh oranges and a spiced rum to warm you right up! To a large 10 qt dutch oven, add apple juice, orange slices, cinnamon sticks, star anise, whole cloves, whole allspice and ginger root. (If you have a spice ball, add clove and allspice to that. It’s easier cleanup after wards. Bring mixture to a boil. Reduce to simmer for 2-3 hours. Add rum to the apple cider mixture and simmer for another 10 minutes. Remove fruit and spices from the pot. This recipe can be made in a Crock Pot as well. Add all the ingredients (except rum) to the crock pot. Turn Crock Pot to LOW and cook for 2-3 hours. Add rum and cook an additional 10 minutes. Serve.